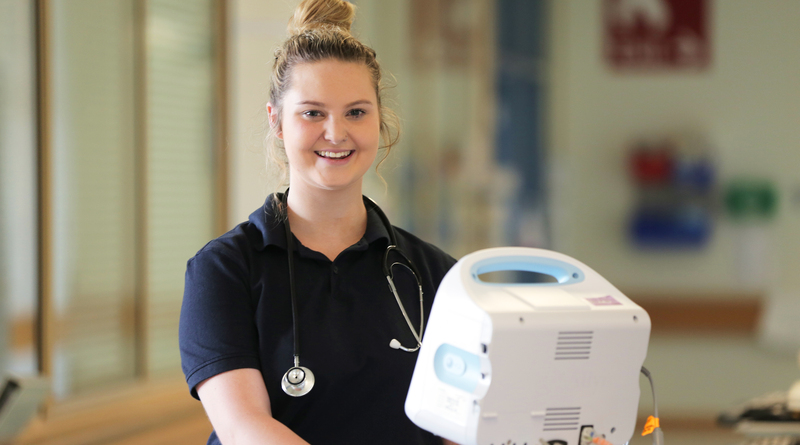 Endorsed Enrolled Nurse Jessica Maher is enjoying her full-time job at Westmead Hospital. Western Sydney Local Health District has welcomed the NSW Government’s announcement of more than 250 scholarships to study nursing and start a career with NSW Health. Executive director of nursing and midwifery and clinical governance Joanne Edwards said the Enrolled Nurse Scholarships are aimed at school leavers wanting to start nursing careers or people seeking an exciting career change. “The NSW Government Enrolled Nurse Scholarships are a great opportunity for anyone in the local community, young or old, considering a career in nursing,” Joanne said. Jessica Maher completed the Enrolled Nurse Scholarship and has now secured full time work at Westmead Hospital’s geriatrics unit. “I found out about it in high school and applied. It was really good to do it this way. Health Minister Brad Hazzard said more than $1.5 million will be spent by the NSW Government on the 2019 Enrolled Nurse Scholarship program, with applications open from today. “This is a fantastic opportunity for anyone interested in pursuing a rewarding career as a nurse at one of our public health facilities or hospitals,” Mr Hazzard said. “Not only does the scholarship include course fees for a Diploma of Nursing but there is a guaranteed job offer at the end of it. In 2018/19, the NSW Government is boosting frontline clinicians across the state, with an additional 950 nurses and midwives. This includes investing an extra $8.1 million for 80 new specialised nursing midwifery and support positions. The scholarships for the Diploma of Nursing are available at 24 campuses, seven in metropolitan Sydney and 17 across each and every regional and rural Local Health District in NSW. To be eligible you must be an Australian citizen or permanent resident living in NSW. Aboriginal people are particularly encouraged to apply for the scholarships, in line with a commitment to grow the Aboriginal workforce across NSW and improve local health outcomes. The scholarships run in partnership with TAFE NSW and the NSW Health Registered Training Organisation. To apply, click here. Applications close on 19 February.